The Rio Grande Phenology Trail connects like-minded organizations through a shared community project. It encourages people to engage in active, outdoor education, and ask and answer local science, management and climate questions. This effort was spearheaded by the USA National Phenology Network’s pilot project with the US Fish & Wildlife Service’s Valle de Oro National Wildlife Refuge. The organizations below are currently conducting weekly phenology monitoring on a suite of focal species, including the Rio Grande cottonwood (Populus deltoides wizlensii) and Siberian elm (Ulmus pumila). Monitoring of plants and animals is conducted using Nature’s Notebook, a project of the USA-NPN. Weekly monitoring will result in scientific data that will provide information on phenological changes both on and off the National Wildlife Refuge System. This information will assist managers to better understand how this region is being impacted by a changing climate, and make management decisions at the Refuge in relation to ecological restoration goals, as well as summarize and present this information back to local communities and schools. These organizations are tracking the phenology of a variety of plants, birds, and mammals. 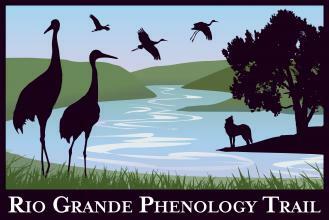 Help us expand the Rio Grande Phenology Trail! Has a site that is staffed by volunteers or paid staff members interested in leading programs related to phenology, one of whom can be a "local phenology leader"
then we invite you to join us! Contact RGPTinfo@usanpn.org for more details on how to participate and partner your organization. Liz Douglass-Gallagher was hired as Rio Grande Phenology Trail Educator in August 2017. Liz grew up in New Mexico and has a deep love for the communities (both human and non-human!) of this place. She received her BS in Biology from New Mexico Tech, and more recently completed an MA in Sustainable Communities from Northern Arizona University. From following whiptail lizards at Sevilleta NWR to interviewing Arizona farmers about climate change, her past work experiences have inspired her to share the wonderful and vital connections between natural and social science with others. After her time away, Liz is excited to be back in Albuquerque and to be working with the Bosque Ecosystem Monitoring Program as an Educator/Biologist. In particular, she hopes both to support and to learn alongside students, volunteers, and many other community members through BEMP, Valle de Oro NWR, and the RGPT! She will be coordinating with Trail Local Phenology Leaders on trainings, data sharing, and outreach to the public, and she is looking forward to helping the Trail grow. Questions about the Trail, or about how to become a Trail partner? Contact Liz at RioGrandePhenologyTrail@gmail.com. Help us collect observations on the Rio Grande Phenology Trail! 1. Register for a Nature’s Notebook account. 2. Fill in your personal account details. Note that on your Observation Deck under Sites you will now be able to switch back and forth in between My Sites and Rio Grande Phenology Trail Sites for the group you selected. This packet contains everything you need for getting new Rio Grande Phenology Trail volunteers starting with making phenology observations: flyers to advertise your workshop, facilitator instructions for a general Nature's Notebook training, and activities to help participants learn how to use Nature's Notebook.